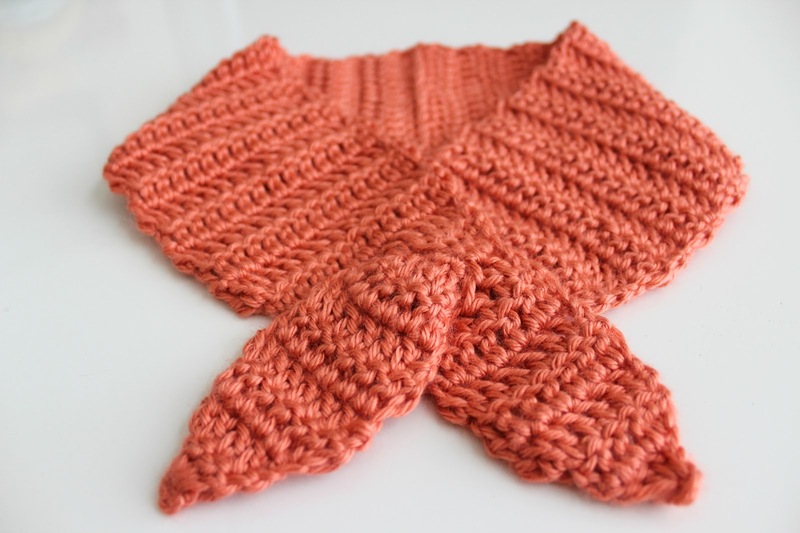 I thought it was about time I share a new FREE crochet pattern. It's been a while! so you should have no problems making one for yourself and all your friends! 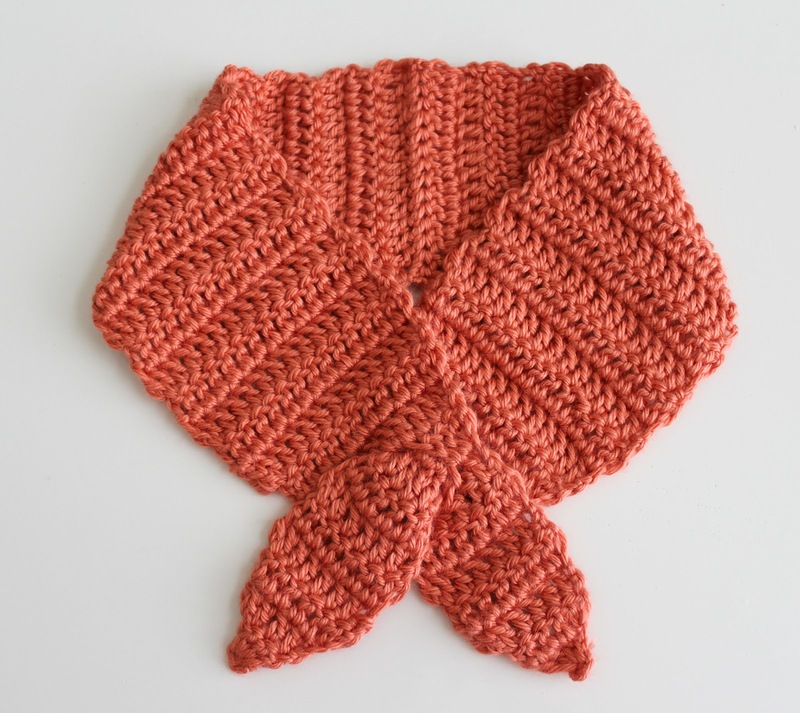 Wouldn't this make a great handmade Christmas gift? I tried to mimick the style of the 1960's silk scarves that I love so much. 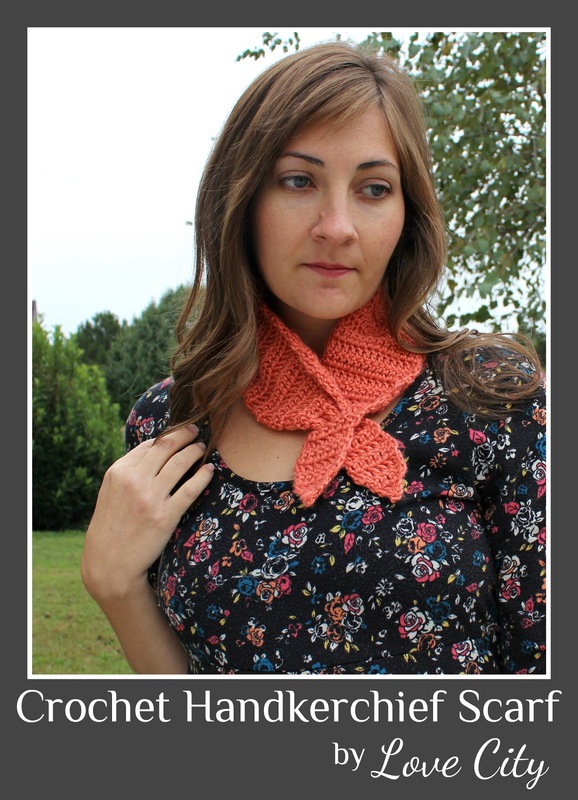 I wanted it to look like a handkerchief tied around the neck, except crochet style. 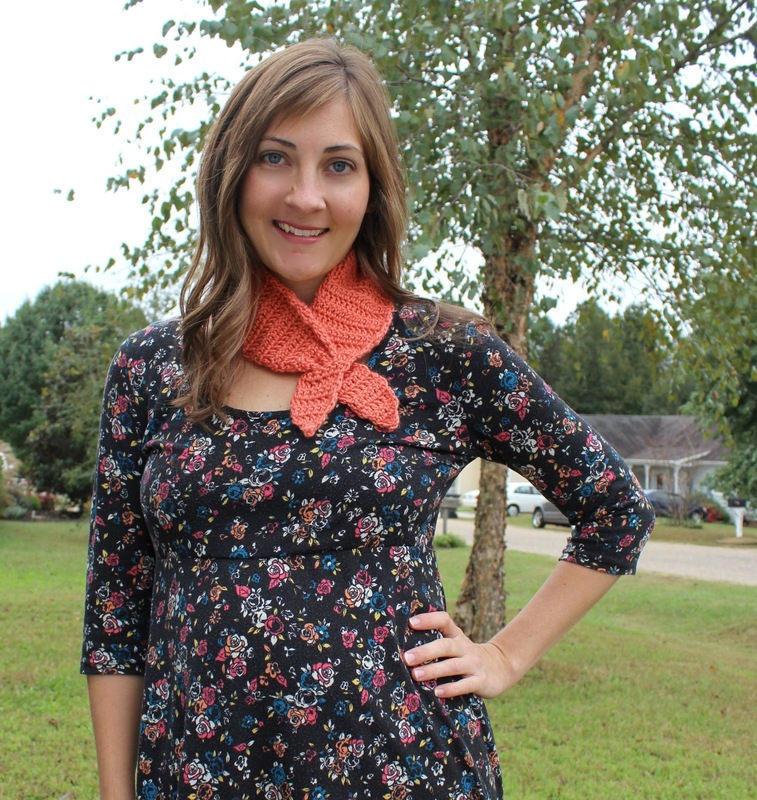 The great thing about this pattern is that you don't need any extra buttons, clasps, or anything! The scarf slides over itself and holds in place really well. Ch 3. Sl st in first ch to create a loop. Ch 2 (counts as first dc here and throughout). 3 dc in loop (4 dc total). Ch 2. Turn. 1 dc in same st. 1 dc in next 2 sts. 2 dc in last st (last stitch is top loop of ch 2 from previous row. You will be using the top loop of ch 2 from previous row as the last stitch in every step for the entire pattern). (6 dc total). Ch 2. Turn. 1 dc in same st. 1 dc in next 4 sts. 2 dc in last st (8 dc total). Ch 2. Turn. 1 dc in next 7 sts (8 dc total). Repeat step 5, 3 times (8 dc total in each row. 4 total rows using step 5 instructions). Ch 2. Turn. 1 dc in same st. 1 dc in next 2 sts. Ch 2. 1 dc in next 2 sts. 2 dc in last st (8 dc total). Ch 2. Turn. 1 dc in same st. 1 dc in next 3 sts. 2 dc in ch 2 space. 1 dc in next 3 sts. 2 dc in last st (12 dc total). Ch 2. Turn. 1 dc in same st. 1 dc in next 9 sts. 2 dc in last st (13 dc total). Ch 2. Turn. 1 dc in same st. 1 dc in next 11 sts. 2 dc in last st (15 dc total). Ch 2. Turn. 1 dc in next 14 sts (15 dc total). Repeat step 11, 16 times (15 dc total in each row. 17 total rows using step 11 instructions). *Step 7. Ch 2. Turn. 1 dc in same st. 1 dc in next 6 sts. 2 dc in last st (10 dc total). Step 8. Ch 2. Turn. 1 dc in same st. 1 dc in next 8 sts. 2 dc in last st (12 dc total). Attach crochet needle to 8 inch tail. Line ends of 2 pieces together. Weave needle through the stitches at the top, making sure to match them up exactly. Make sure your weaving is tight. Weave in loose ends. Your weaving should not be noticeable. 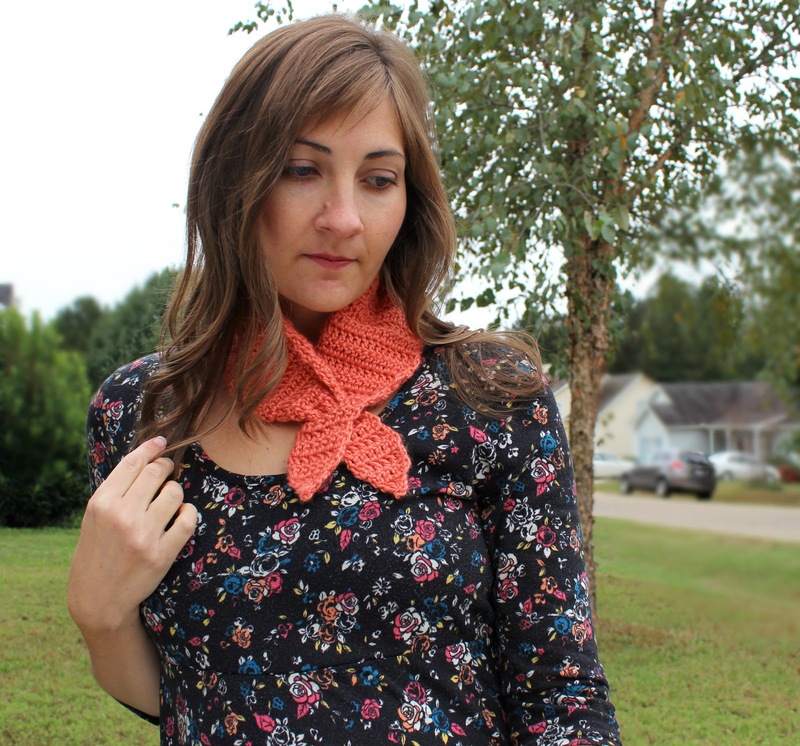 To wear: Lace one end of scarf through the open hole in the opposite end. Got a question about this pattern? Cool idea! And love the new layout! found your blog through oh, sweet joy! 's handmade holidays... following along now!